Had a blast at yesterday's Cheddarsphere Christmas Party. Friends I have not seen since last year's party. It was good to see them again. Best part about it was that I was able to sit most of time and sit through an entire Packer game. I was out knocking on doors before and after the event. It is also kind of cool to sit through an entire Packer game and not sweat the outcome. You gotta love this photo. 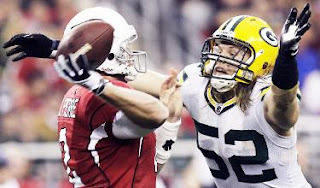 Clay Matthews was just welcoming the third string Arizona quarterback to the NFL. Clay thought he would give the new guy a great big hug. I do not know how Clay does not win Rookie of the Year. Tell me you do not love this guys enthusiasm.